Access via the New Project wizard: When creating a new project, the Image Properties Editor window appears after loading the images. This table is used to describe and edit the information and the status of the images used for the project. By clicking the column Image, the title will be used to sort the table, it will be ordered from the smallest to the highest value. By clicking again the column, the title already used for sorting, will be switched from smallest to highest and from highest to smaller and vice versa. Smallest to highest values. Highest to smallest values. Left click any of the image's cells. The row corresponding to the selected image is displayed in blue. For images that are displayed one after the other: Press the Shift key and left click the first and last images to be selected. The rows corresponding to the selected images are displayed in blue. Alternatively, left click one image and while keeping the left button clicked, move the mouse up or down. For images that are not displayed one after the other: Press the Control key and left click all the images to be selected. The rows corresponding to the selected images are displayed in blue. 1. Click the box (the status switch between selected / unselected). 1. Double click the cell. 2. Type the new value or click the left arrow to select among the existing values. 3. Click Enter or click outside the cell. 2. Type the new value. 1. Right click one cell of the column. 2. Click Enabled All Images or Disable All Images. 2. Click Edit All Groups. 3. Type the new value or click the left arrow to select among the existing values. 4. Click Enter or click outside the cell. 2. Click Edit All Altitudes / Horz. Accuracies / Vert. Accuracies. 1. Right click one of the selected cells of the column. 2. Click Enabled Selected Images or Disable Selected Images. 2. Click Edit Groups in Selected Rows. 2. Click Edit Altitudes / Horz. Accuracies / Vert. Accuracies in Selected Rows. The status of the image is displayed in the Enabled column. It is defined by a box that indicates if the image is used for the processing or not. If the box is selected, the image is enabled and is used for the processing. To select or unselect an image: Left click on the box. Note: The disabled images are not deleted from the project in case of further need to use them. This column displays the name of the images. It cannot be edited. One point cloud of automatic tie points for the whole project. The color of the automatic tie points will be mixed: some points will take color from the RGB images and others from the NIRGB images. One densified point cloud per group. One DSM for the whole project. Important: Images taken by the same camera during different flights should not be grouped into different groups, unless there is need to generate different orthomosaics for each data. Tip: Use the groups to group images with different spectral signatures (RGB, NIRGB, etc). In this case different reflectance maps are generated that can be used for index calculations. For more information about index calculations: Menu View > Index Calculator. By default the images that have the same number and type of bands as well as the images with the same pixel type (byte, float) will be grouped as group1. Images with different bands and pixel type will be grouped as group2, group3, etc. To change the group of one image, double click on the corresponding cell and edit the group. For more information about editing the group of multiple images: Menu Project > Image Properties Editor... > Images Table. Important: When having more than one group, the Google files (Google Maps tiles and .kml) will only be generated if one of the groups is named RGB (capital letters). Then the Google files will be generated only for this group. For projects with more than one camera model, this column displays the camera model assigned to the corresponding images. To change the camera model of one image, double click on the corresponding cell. Click on the arrow that appears and, from the drop-down list, choose the desired camera model. Note: The camera model can only be chosen among a list of detected camera models for the project. Latitude [degree]: If the coordinate system of the images is a geographic coordinate system. X [m]: If the coordinate system of the images is a projected coordinate system. The unit is given in meters. X [feet]: If the coordinate system of the images is a projected coordinate system. The unit is given in feet. Local X [m]: If the coordinate system is defined by the user (local coordinate system). The unit is given in meters. When importing the coordinates from the image EXIF data if the information exists. When importing the coordinates from the image geolocation file. When manually editing the table: double click on the corresponding cell and enter the coordinate. Note: If no image geolocation has been imported then the value of the cells is zero (0.000). Longitude [degree]: If the coordinate system of the images a geographic coordinate system. Y [m]: If the coordinate system of the images is a projected coordinate system. The unit is given in meters. Y [feet]: If the coordinate system of the images is a projected coordinate system. The unit is given in feet. Local Y [m]: If the coordinate system is defined by the user (local coordinate system). The unit is given in meters. Altitude [m]: If the coordinate system of the images is a geographic coordinate system. Z [m]: If the coordinate system of the images is a projected coordinate system. The unit is given in meters. Z [feet]: If the coordinate system of the images is a projected coordinate system. The unit is given in feet. Local Z [m]: If the coordinate system is defined by the user (local coordinate system). The unit is given in meters. Note: If no image geolocation has been imported then the value for the cells is zero (0.000). The Z coordinate must be given in the same unit as the (X,Y) coordinates (meters or feet). All image geolocation coordinates have to be given in the same coordinate system. Defines the horizontal accuracy value (Accuracy Horz). The horizontal accuracy refers to the first and second coordinates (latitude, longitude, or X,Y) of the images. Very accurate image geolocation (latitude, longitude, or X,Y) coordinates: Low accuracy value. Non accurate image geolocation (latitude, longitude, or X,Y) coordinates: High accuracy value. 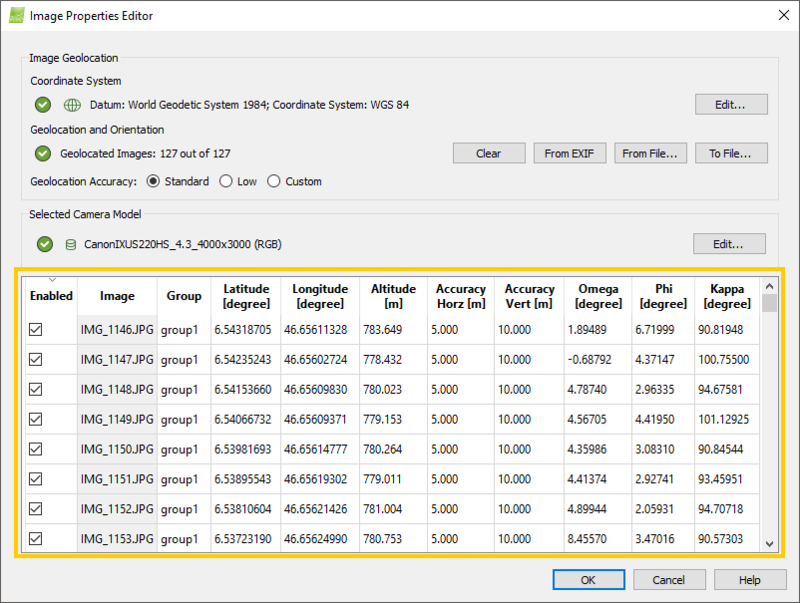 The higher the accuracy value, the less impact the image's coordinates will have on the Initial Processing, compared to other images or GCPs with lower accuracy values. The accuracy is a value between 0.001 and 10'000. Warning: The horizontal accuracy must be given in meters or feet according to the selected coordinate system. To edit the horizontal accuracy of one image, double click on the corresponding cell and enter the new value. For more information about editing the horizontal accuracy of multiple images, see Actions on the table. Defines the vertical accuracy value (Accuracy Vert). The vertical accuracy refers to the third coordinate (altitude or Z) of the images. Very accurate image geolocation (altitude or Z) coordinate: Low accuracy value. Non accurate image geolocation (altitude or Z) coordinate: High accuracy value. The higher the accuracy value, the less impact the image´s coordinate will have on the Initial Processing, compared to other images or GCPs with lower accuracy values. The accuracy is a value between 0.001 and 10'000. Warning: The vertical accuracy must be given in meters or feet according to the selected coordinate system. To edit the vertical accuracy of one image, double click on the corresponding cell and enter the new value. For more information about editing the vertical accuracy of multiple images, see Actions on the table. Omega (ω) is the rotation around the Χ-axis. It is given in degrees. When importing the angles from the image geolocation file. When manually editing the table: Double click on the corresponding cell and enter the angle. This value is optional as Pix4Dmapper does NOT require the orientation of the camera in order to process the projects. For more information about how Pix4Dmapper defines the Omega - Phi - Kappa angles: How are defined omega, phi, kappa?. Phi (φ) is the rotation around the Y-axis. It is given in degrees. Kappa (κ) is the rotation around the Z-axis. It is given in degrees.